Here at Ipswich Mazda, our helpful team of Mazda experts seek to bring our customers joy through the ownership of their new Mazda vehicle. We’re always available to offer advice and support, and to ensure that when you drive away in your new Mazda you’re filled with pride and confidence. Our new Mazda vehicles are not only known for their Zoom-Zoom factor, but also their impressive fuel economy and cutting-edge safety technology. Whether you’re looking for an athletic CX-5 to tackle the open road, or a compact and sporty Mazda 3 to zip through the city, Ipswich Mazda has a Mazda for sale that will help take your driving experience to the next level. For your peace of mind, all new Mazda cars come with a 5 year unlimited Kms warranty. As well as our fantastic New Mazda Range available, we stock a great selection of Used Cars and Demo Mazda vehicles. 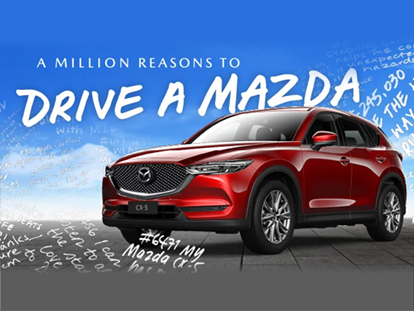 On top of this, our IpswichMazda dealership also offers stress-free Car Finance solutions to get you behind the wheel of your new Mazda sooner. Contact Us to book a test drive and experience Mazda’s amazing technology today.